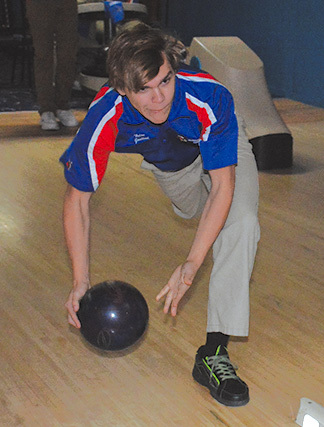 Battling a veteran team, weeks after weather forced the postponement, the Decorah varsity bowling teams fell at Forest City Tuesday night. The varsity boys (4-6) dropped the match 2,714 to 2,963. Baker scores for the Vikings were 173, 204, 234, 244 and 183. Keagan Einck and Tyler Thompson had good games for Decorah. Einck produced 166 and 201 scores, while Thompson rolled games of 201 and 166. Other scorers for the Vikings were Mason Hill (132, 135), Breydon Johnson (202, 136), Nolan Jostand (161, 151) and Justin Redenius (170, 122). The JV boys lost 2, 107 to 2, 370 to move their record to 8-2. At the forefront of the JV squad were Brendan Hunter (319) and Lacie Bjergum (276). The varsity girls (5-5) fell to Forest City 2,416 to 2,535. Baker scores were 158, 140, 145, 157 and 194. “I am very happy with our scores. Some days your best just isn’t enough as Forest City bowled 300 pins over their average,” explained Coach Bruening. Leading the Lady Viking charge was Audrey Casterton with games of 196 and 146. Katherine Bruening had solid games of 170 and 153 in Decorah’s effort. Coming through with scores of 165 and 155 was Moriah Grinna. Also on the lanes were Lexie Hauber (150, 169), Maddie Putnam (159, 159) and Alexis Svestka (150, 162). The individual conference meet is Saturday, Feb. 9, at Oelwein, beginning at 1 p.m.